Volume two of the Diamond Gem Award-winning comics magazine IMAGE+ begins now! Fans have been eagerly awaiting the return of SCOTT SNYDER & JOCK's smash-hit horror series WYTCHES ever since the first season ended on a brutal cliffhanger. Now, they're back with a taste for the upcoming second season of the series by serializing what happens next in IMAGE+! How did Sailor make it to safety? What has she been doing since? The answers can be found exclusively in IMAGE+ with an extra-sized first chapter this issue. 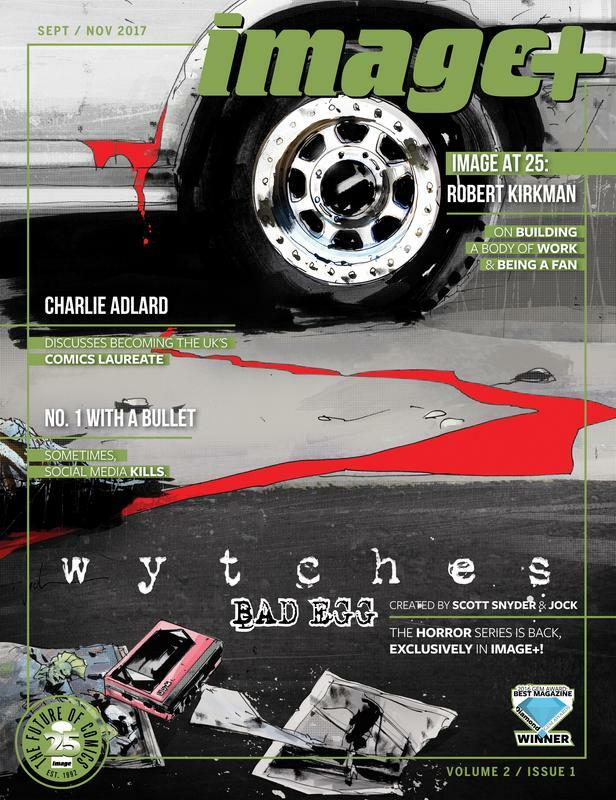 In addition to the return of WYTCHES, IMAGE+ is now a hefty 80 PAGES at no additional cost, meaning more room for longer, more fascinating interviews, exciting previews, and in-depth features on comics, creators, cosplay, conventions, and comics culture. IMAGE+ remains your number one source for news and information about Image Comics, and now's the perfect time to get in on the ground floor.